All Are Precious In His Sight: Save the Date! I don't know if y'all will be able to see this large enough to read it. I think if you click on the photo, it will show it larger on another screen. In memory of Chrissie and in remembrance of the day Chrissie went to heaven (which is approaching all too quickly), we are hosting the first annual “Boss Your Heart” Benefit on Saturday, May 21, 2011 from 10AM-5PM at the San Marcos Civic Center. There will be a team roping event, along with children’s activities, food/concessions, a silent auction, and a whole lot of family fun! We are in the process of forming a 501c3 (non-profit) in memory of Chrissie as well. All proceeds from the benefit will go to Boss Your Heart Orphan Ministries, which will be a non-profit to help orphans in memory of Chrissie. We NEED help to make this possible. God recently laid this idea on our hearts, not leaving us a whole lot of time for planning, but we feel confident that He will lift up a team of volunteers to help us make this dream a reality. If you would like to help us with this benefit, please contact me at Lorraine@ForgottenSawRanch.com. We would be so very blessed by your support! There are so many areas where we need help; there will be something for everyone to do. Please prayerfully review the list below to see if God might have you help in some way. We are grateful for your friendship, prayers and support, and we look forward to seeing what God does as we commit to carrying out the legacy of love, joy, and hope that God so abundantly blessed us with through our Princess Chrissie. It is our greatest desire to bring God’s love to orphans around the world through the efforts of Boss Your Heart Orphan Ministries, all for His glory, in memory of our precious princess. Please forward this to anyone you know who might want to help! 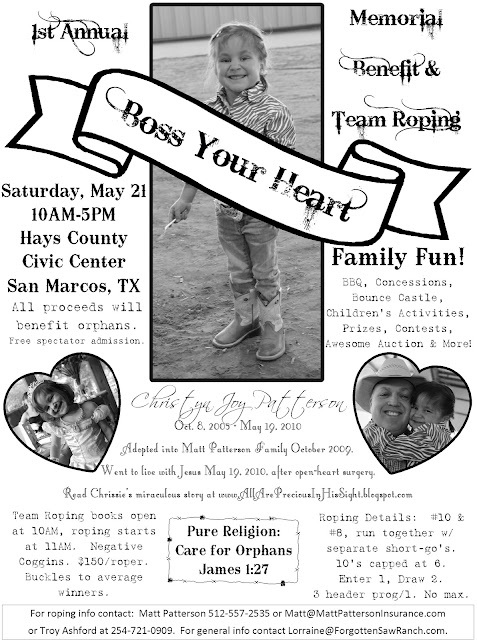 Team roping, children’s activities, silent auction, food/concessions, family fun! o Need lots of helpers to serve, work shifts, etc. o Would like to have a cotton candy machine, sno cones, etc. o Need lots of volunteers to set up activities, work shifts, etc. o Need someone to solicit prizes: saddle?, buckles? o A friend has great ideas for the website (and is able to do a lot with websites), but it would be extremely helpful if someone would be willing to build the website template. Help us raise funds for the 2011 Boss Your Heart Memorial Benefit, in memory of Chrissie. Day 10: BOSS YOUR HEART DAY!!! Help Make Vanya's Dream Come True! Orphan Hosting Opportunity; Kiddos Need Families!